One of the most frequent questions I’m asked is, can I camp in a Walmart parking lot? This has crossed your mind too, right? Unexpected traffic on the interstate or a longer than expected meal at a diner and you’re not going to make your destination. It’s getting late—and all you want is to settle down and relax for the night. Spying a Walmart parking lot you think, surely it would be fine? This article explains when you can, and when you cannot, camp at Walmart. You’ll have all the facts, including some handy tips, for a safe and enjoyable night. So… Can I Camp At Walmart? It would be nice to have a definitive answer. Yet, as with most things in life, it’s not that simple. In short, the answer is, yes and no. Here’s the thing—Walmart has over 5000 stores in the US alone. That’s a lot of parking spaces which are ideal and convenient for overnight stays. Walmart values RV travelers and considers them among our best customers. Consequently, we do permit RV parking on our store parking lots as we are able. However, there is a caveat. While the company does not forbid it, it’s actually down to the individual store manager to decide whether or not they allow camping. So, if the store manager spends every free weekend out in their RV, you’re probably in luck. There’s a further issue too—it’s not all down to just Walmart and the manager. Some cities have ordinances which forbid vehicles from being in parking lots overnight. So always check with the relevant authority to ensure it’s allowed. Just because the store manager says it’s fine, this doesn’t prevent an eager police officer from presenting you with a ticket. How Do I Check Which Walmarts Allow Camping? Once you know that the city allows overnight parking in lots, it’s time to check the store. Firstly, if you’re out on the road and see a Walmart that’s suitable, park up, shoot into the store and ask to speak to the manager. You will hear from the horse’s mouth whether camping is allowed or not. If nothing else, this is excellent etiquette, and I would recommend at least saying hello to the manager—even if you know parking is permitted. Secondly, there are a couple of useful websites that indicate which Walmarts are suitable for camping. Walmart locator has an excellent directory of the stores where overnight stays are forbidden. Conversely, Allstays lists those that do allow camping. That being said, a recent change in the store manager, company policy, or local laws, could mean that these directories may not be completely up to date. So, to be sure, it’s always wise to check directly with the store itself. Why Would Walmart Not Allow Camping? Remember this—Walmart allows us campers to stay there out of their own generosity. There could be some argument that it’s not entirely altruistic—I’m sure they generate quite a substantial amount of income from RVers. However, ultimately, as a listed company responsible to the shareholders, it’s a retail business—not a trailer park. They have no obligation whatsoever to provide overnight camping. The litterbug campers that give the rest of us a bad name. Lack of space—RVs can take up many spots. Shameless campers taking up residence in the parking lot for extended periods. 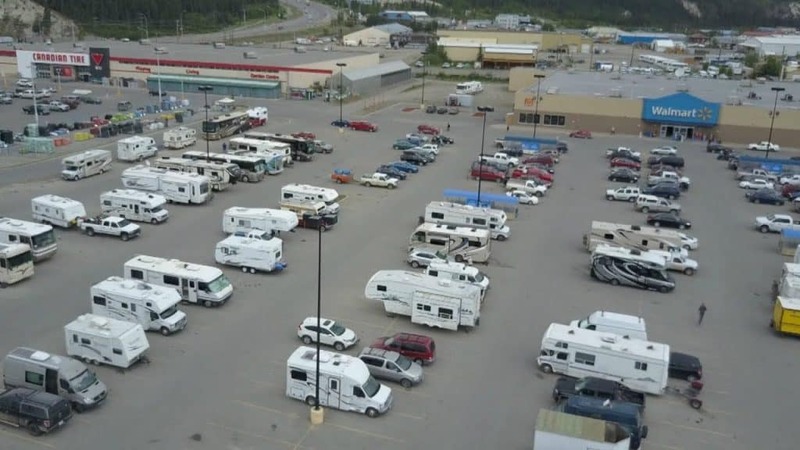 It’s understandable that not all Walmart stores want RVs parked in their lots overnight. However, when they do, be gracious and follow the etiquette that’s explained later in this article. The better a camper you are, all the more stores will be available for us all. What Are The Pros And Cons Of Camping At Walmart? Parking lot camping, which is sometimes referred to as boondocking, is not for everyone. Cheap—in fact, it’s free. That’s the best camping deal you’re ever going to get. Despite it being a change from the norm, it’s not very picturesque. Concerns over crime and security. No access to electricity, water, or dumps. Can be noisy, depending on the location. Not great for kids due to high traffic. Terrible for outdoor grilling or fun. Is Camping At Walmart Safe? Crime is listed above as one of the cons, and this is worth bearing in mind when staying at Walmart. Over a five-year period, one Walmart store was attended by police officers over 5000 times. While this may be an exception rather than the rule, being sensible about which Walmart stores to stay at is advisable. First, use some common sense. If you pull into a Walmart parking lot and you see empty alcohol bottles lying around, unsavory types loitering, or a nearby dodgy bar—it’s probably best to steer clear and find somewhere else for the evening. Second, if the Walmart overnighter is planned, check the area beforehand. If you head over to city-data.com, you can type in a Walmart’s location and check crime rates before you stay. Finally, if you do settle down in the parking lot for the night, take precautions. Make sure all doors and windows are locked, nothing is left outside, and formulate a plan in the unlikely event that you encounter an intruder. Following the below suggestions can make your Walmart camping experience as successful as possible. Once you park up, there’s little chance of having access to electricity. So, if you want to turn on your enormous LCD TV, you’re going to need a generator. However, bear in mind that these generators can be a bit noisy. At the very least, select one of the quiet runners to prevent annoyance to fellow campers, Walmart customers, and local residents. Additionally, do not run the generator throughout the night. You could have some irate people knocking on your trailer door in the morning. Of course, you’re parked next to a supermarket that’s jam-packed with water. However, getting a five-gallon bottle tipped into your tank isn’t that easy. Parking lots don’t usually provide water for filling RVs, so ensure you have ample supply before you pull up. Also, what goes in must come out. There won’t be any facilities for dumping gray or black water, so you will need to make alternative arrangements. A useful tool is rvdumps.com, which lists stations across the USA where this waste can be left. You’re basically enjoying a trailer park for free. So give something back—use the store for your supplies. A nice way to do this is by introducing yourself to the store manager, asking for his or her permission to stay, saying thanks, and indicating that you’ll shop for your groceries and supplies in the store. You’ve been allowed a parking spot, not an entire recreation ground. Don’t take liberties with the outside areas. Sunbathing in the parking lot. Firing up the grill or using the outside kitchen. Playing football—or any sport for that matter. Just because you’re away from home and you’re having a fantastic time, others around you may just be going about their daily business. Take care that your actions have minimal effect on others, whether they are your camping comrades or just local residents. Keep any pets joining you the journey on a leash. Clean up any pet calls of nature. Dress suitably for a parking lot—it isn’t a beach. Only stay for one night. Keep music and general noise to a minimum. To cause minimum disruption to the store and its customers, try to arrive as late as possible in the day and leave early in the morning—after cleaning up, of course. In this way, hardly anyone will notice that you’ve been there. Here’s a cool video from Vicari, speaking about the Dos and Don’ts. Are There Alternatives to Walmart Parking? Camping in a Walmart parking lot is cheap, easy, and very convenient. Always ensure that your store of choice allows overnight stays before you settle down for the evening. Following the above tips will not only allow you to have a pleasurable experience but will also ensure that Walmart is justified in allowing campers to stay overnight. Thus, others will also be able to enjoy the facility, and it gives a good name to outdoor enthusiasts. I hope you enjoyed this article and that it’s helped you in deciding whether or not to consider camping overnight at Walmart. If you have any questions or opinions, please feel free to use the comment section below, and please remember to share.